Central Florida Community Arts is proud to present Young Artist Orchestra in Concert, the inaugural concert of its brand new youth orchestra! The CFCArts Young Artist Orchestra is an auditioned group comprised of performers under the age of 18. These extraordinarily talented young people come from all over the Central Florida area to perform beautiful music under the batons of some of the most respected conductors in the area, including Dr. Alvaro Gomez. Patrons of this concert can expect to hear Symphony No. 1 “Titan” movement 4 by Gustav Mahler, Carmen Fantasy for violin and orchestra by Pablo de Sarasate (with violin soloist Dr. Routa Kroumovitch), plus other works. 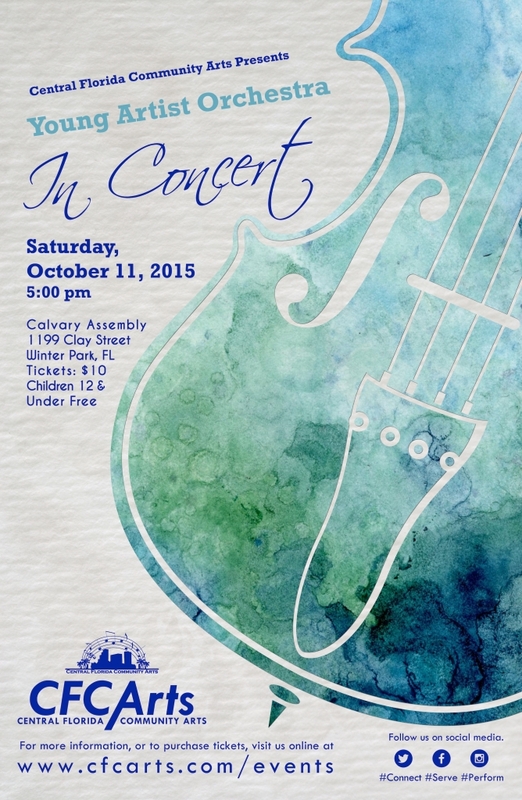 Young Artist Orchestra In Concert will be performed at Calvary Assembly, 1199 Clay St. Winter Park, FL 32789, at 5:00pm on Sunday, October 11. General admission tickets are $10 each and children age 12 and under will be admitted for free.